Sorry to keep banging on about lousy construction, but upon further inspection I noticed even more shoddy details in that concrete slab. Walking across it, I noticed it's about as flat as the Hindu Kush. Clearly they made no effort to level across the forms and just eyeballed it as they were pouring. 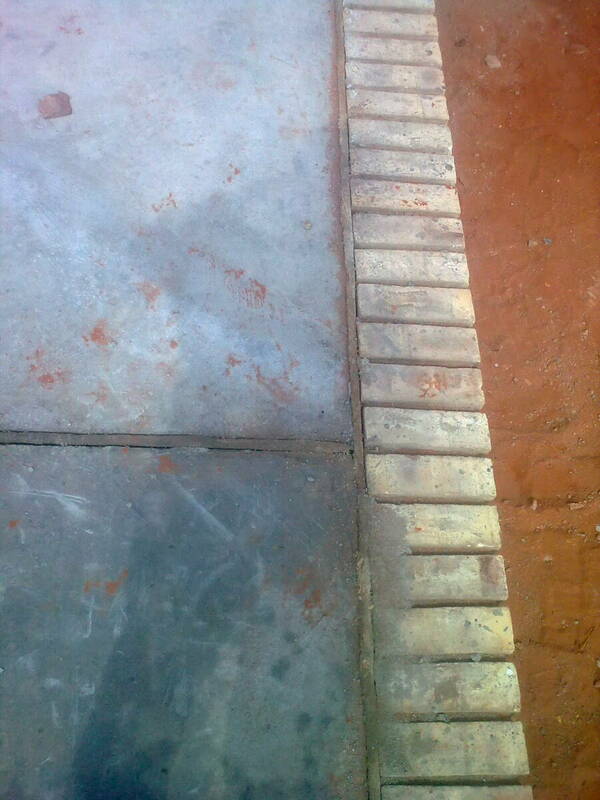 Worse, they didn't even strip the forms (the wooden bits that define the shape of the slab) before laying brick on the side, as you can see in the picture. That wood will eventually rot, leaving a gap between the slab and the brick, destabilizing both and leaving a perfect habitat for termites and other pests. However, it's probably a safe bet that the slab itself will have crumbled to smithereens by that time anyway. I say this all to reinforce the fact that it is not lack of money that is holding back South African education. And because I've poured a lot of concrete in my day and it bugs me when people screw it up this badly.